In the past half year, I've discovered a group of people who are passionate about children's story apps and ebooks: developers, publishers, authors, illustrators, reviewers, educators, and more. They meet every Sunday evening at 9 p.m. EST at the #storyappchat Twitter chat and share their expertise in this growing field. 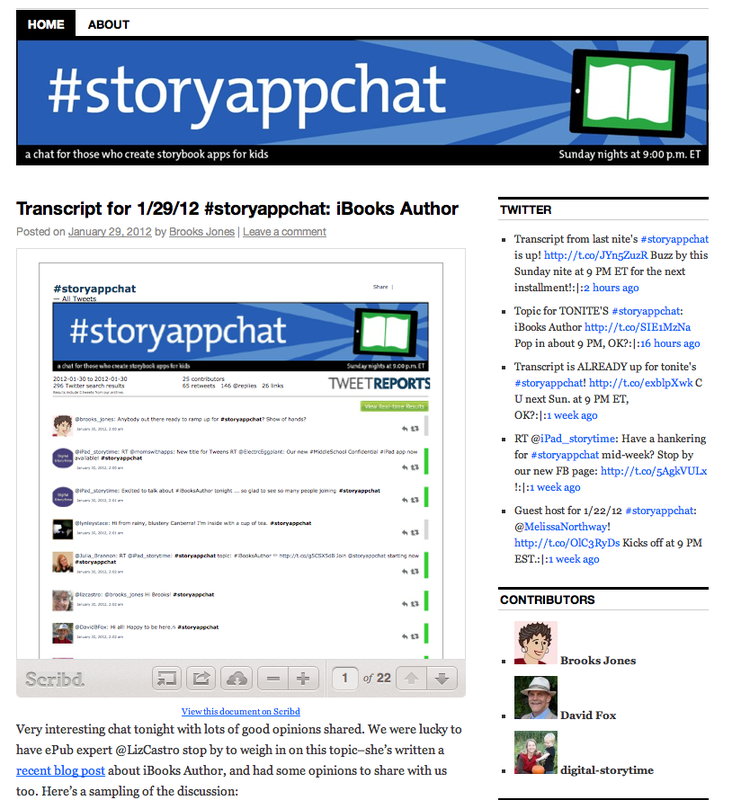 Storyappchat's website provides archives of past chats and its Facebook page continues the conversation during the week. Wait... what's a Twitter chat? A Twitter chat is a real-time conversation that occurs on Twitter. Anyone can follow or participate by using a hashtag (in this case, #storyappchat) in their tweets at a designated time. Websites like Tweetchat make it easy to follow a Twitter chat. The comments fly by quickly and often several conversations happen at once. Children's illustrator Debbie Ohi has a great list of Twitter chats for writers and an overview of how Twitter chats work. 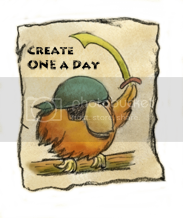 Storyappcat is becoming the networking hub for the growing industry of children's story apps. Organized by author/illustrator Brooks Jones (@brooks_jones), and co-moderated by ebook author/producer David Fox (@DavidBFox) and apps reviewer Carissa Kluver at Digital Storytime (@iPad_storytime), each week's chat features a different aspect of the making of story apps or ebooks. Often guest speakers will discuss their apps and lessons learned from the production process. Sometimes topics focus on specifics, such as sound effects, social media marketing, or new platforms (like iBook Author). Brooks Jones (@brooks_jones): chat moderator, author/illustrator, with a storybook app I Don't Like Pink! David Fox (@DavidBFox): chat moderator, producer of several apps, Middle School Confidential: Be Confident in Who You Are and Middle School Confidential 2: Real Friends vs. the Other Kind and an iBook, Are You My Friend? Loreen Leedy (@LoreenLeedy) children's author/illustrator with over 40 published picture books with a recently published iBook, Tracks in the Sand; blogs about ebooks at her blog and e is for ebook. Annie Fox (@Annie_Fox): educator and author of several apps, Middle School Confidential: Be Confident in Who You Are and Middle School Confidential 2: Real Friends vs. the Other Kind and an iBook, Are You My Friend? MTechman (@mtechman): librarian who blogs and tweets about tech. Participates in #storyappchat because, "As a librarian with no devices yet, I want to learn as much as possible to be ready to consume AND produce." Ron Martinez (@ronmartinez): founder of aerbook.com, which develops and designs advanced interactive standards-based ebooks. I've probably left many more off the list, but this gives an idea of the depth of talent and smarts that gather most Sundays. If you are making story apps and ebooks or interested in learning more, please feel free to join the conversation. Q. When did #storyappchat begin? We started it back in May of last year. So it's not quite a year old. Q. What was the impetus for the chat? 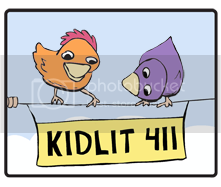 A small group of us hung around after #kidlitchat and started talking about apps for kids. I started to realize that a chat focused on storybook apps for kids would fill a need for writers, illustrators, developers, educators and others interested in child literacy. The more I thought about it, I realized I wanted not only for the chat to exist, but also to be behind it. So I decided to go ahead! Q. What's do you like best about #storyappchat? The thing I love most about #storyappchat is the free exchange of information and opinions. I have a feeling that it's become not only a good resource for people, but also a great way to network with other people interested in electronic books for kids. I love knowing that it's been helpful for others! Great post Sylvia! #storyappchat is quite innovative as it provides great information for those either interested in developing apps or those who use the apps in the home or classroom! Thanks for compiling the information! This is wonderful, Sylvia! So impressive to see all the topics we covered, and I love the profiles on some of the regular participants! Thanks for putting this together! Sylvia: thanks so much for putting this together. 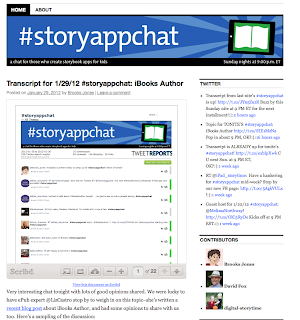 Great 'behind the scenes' look at what #storyappchat is all about! the storyappchat team really rock! Such amazing group of people! We love Story App Chat! Thanks for the mention. I will forward on to my writer and illustrator friends! Thank you all for these comments...it's a great group of people. I always learn something new. If you want to try the modern social marketing tactics that works effectively then you may contact DaniDee.co.uk online media company for seeking help from the highly experienced professionals.